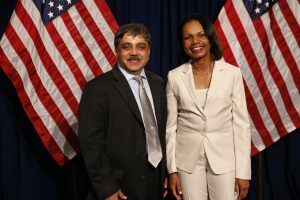 Sapphire Call to Lead Purpose: Great for the World and Good for Business - Logistic Solutions INC.
AL Limaye with Ex-President, US – Barack Obama and Condoleezza Rice at Call2Lead event, SapphireNow 2018 hosted by President, SAP – Jen Morgan. There are issues near and dear to everyone’s heart. And many people find that having a purpose – committing their time and energy to a higher cause – gives their lives greater meaning. Since businesses are composed of people, it’s natural that companies are taking a similar stance. More and more organizations today are supporting noble societal causes and prioritizing policies that make the world a better place. It’s the right thing to do. But there’s also an often-overlooked by-product: It creates real business value. People are proud to work for companies that putpurpose-driven activities at the forefront of their operations. For more than 25 years, the enterprise I found and run– Logistic Solutions Inc., has taken keen interest in meaningful issues, such as protecting the environment, reducing homelessness, and helping people with disabilities. In 2001, we launched Adopt-A-Company, a voluntary, probono program aimed at connecting large enterprises with small organizations recovering from losses due to the tragic events of 9/11. The large companies “adopt” the small businesses by supporting them with foot traffic, client referrals, monetary/in-kind donations, or other free services. More than 400 establishments have benefited from our Adopt-A-Company initiative to date. We also emphasize the importance of diversity and inclusion in the workplace. Our dedication to building an unbiased environment that provides equal opportunitiesregardless of gender, race, or sexual orientation is unwavering. Currently, 75% of our workforce is composed of either female or Asian-American employees. And we have plans to engage differently abled individuals, military veterans, and senior citizens to join our staff in the future. Our sustainability efforts involve reducing the use of natural resources, minimizing our environmental impact with energy-efficient technology, and developing solutions that create customer value and protect our planet. We’re fulfilling our environmental responsibilities by participating in an internal Energy Saving Program and subscribing to the 3-R philosophy (reduce, reuse, and recycle). Many organizations around the globe are dedicating their companies to the greater good. And with a growing commitment to sustainability, diversity, and other important issues, we’re all playing a critical role in shaping our future. Supporting purpose-driven activitiesis the right thing to do. But committing to these efforts can also provide your organization with plenty of valuable business outcomes and opportunities. Our company, for instance, has benefited from creating a diverse, inclusive workforce. Not only have we expanded our knowledge base with contributions from people of different genders, races, and sexual orientations, but our standing as a Certified Diverse Supplier has continually put us in a position to grow our business. Specifically, it has allowed us to participate in minority councils and meet with stakeholders from large companies,leading to potential business connections. And we surely aren’t the only organization that has reaped the rewards of having a diverse, inclusive workforce. A 2017 McKinsey report found that companies whose executive teams rank in the top 25% for racial and ethnic diversity are 33% more likely to financially outperform their industry peers. Harvard Business Review says that organizations with more diverse leadership out-innovate competitors. And a new Cloverpop study reveals that inclusive teams make better business decisions 87% of the time. Succeeding as a business is secondary to doing right in the world. Though, of course, every organization should aim to do both. Customers don’t only want to do business with enterprises that are capable, they want to be involved with companies that share their values on diversity, inclusion, sustainability, and other societal causes. They want to know that your organization stands for something truly important – just like they do. Remember: Putting purpose at the core of your company is both great for the world and good for business.